There’s one reason and one reason only to travel to the crowded, dirty Indian market in Jackson Heights (Queens). And that is to gorge on the variety of Indian sweets at Maharaja Sweets on 37th Ave.
An Indian vegetarian restaurant plus sweet store, Maharaja Sweets has been one of my favorite sweets destinations for years now. Service was disgustingly rude a few years back but the severe competition has prompted the staff to mellow down and treat customers better lately. There’s still scope for improvement in service. 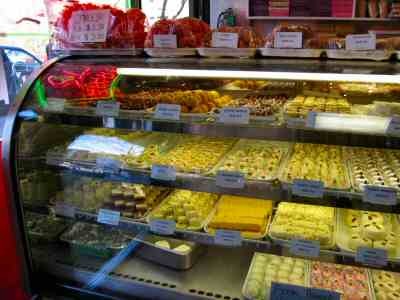 Maharaja Sweets offers yummy Indian sweets for $8-$9 a pound depending on your pick. I tried a pound of assorted milk based sweets including Kaju Katli, Almond Burfi, Anjeer, and two types of Kalakhand. As always, I was swept away by their delicious taste and freshness. If you go there, ask for a pound of mixed sweets. That way you get to try different sweets. Maharaja also offers a vegetarian lunch buffet and yummy Samosa Chaat (Indian street food). Good selection of Indian sweets. $8-$9 per pound. Almond, Pistachio & Cashew Sweets are $9 per pound.